Fully automate the collection, storage, and distribution of email Opt-Out data and Unsubscribe lists while maintaining compliance with regulatory guidelines. OPTIZMO™ is a convenient, web-based and feature rich compliance platform that enhances the security, visibility, and efficiency of email suppression list management throughout an entire ecosystem of channel partners. Providing one-click unsubscribes, automated file transfers, automated distribution of secure access keys, and alert notifications also makes OPTIZMO the easiest email compliance platform to use and the most robust automation application for the collection, storage, and distribution of email suppression lists and customer files. Through modular UI/UX design and architecture, you are better able to segment relevant analytical data throughout a relational hierarchy. Meaning that every list, campaign, and affiliate partner has a unique profile page that allows you to monitor your email compliance at both a macro and micro level. 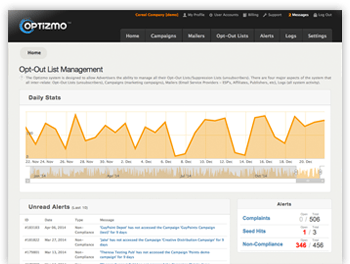 Whether you want to simply view a campaign profile to determine how many unsubscribes have been recorded within a specific campaign for a specific time frame OR whether you want to view a specific mailer’s profile within a specific campaign, attached to a specific list you distribute — OPTIZMO’s email suppression list management platform delivers. Before OPTIZMO, list cleansing and email suppression list distribution speeds could take hours. We sought to increase these speeds exponentially via a proprietary data query algorithm and by investing in high-volume, long haul data transports across a network of SSAE 16 certified and fully redundant data centers throughout the US. OPTIZMO, while most known for its speed, is also the most in-depth analytical application of its kind. As an OPTIZMO user, you will have insight into: Suppression List Abuse through unique seed addresses that are auto-embedded during the distribution process to bait and capture those who would abuse your sensitive data, Recipient Complaints direct from consumers who have previously unsubscribed, and Non-Compliance Alerts notifying you of when your affiliate partners have not downloaded or cleansed against your suppression data within the time allowed to remain compliant with the FTC’s CAN-SPAM Act. You are only as smart as you are informed. OPTIZMO’s email suppression list management platform informs you of every piece of relevant analytical and statistical data you need to intelligently manage your email compliance standards in conjunction with email campaign and mailer performance metrics. 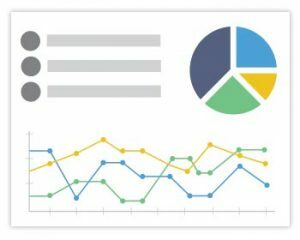 Our philosophy has always been that COMPLIANCE IS A PERFORMANCE METRIC and therefore knowing and understanding the negative marketing signals gained from consumers during the unsubscribe process better informs you as to how a specific campaign is performing, the email volume of your email offers, and your overall brand integrity. OPTIZMO is designed around the one-to-many hierarchical relationship of email suppression lists, email campaign offers, and affiliates/mailers. Individual profiles are automatically created within OPTIZMO and tracked with relevant analytical data. Data is then formatted in profile pages that are easy for users to digest and comprehend. Our users are able to easily determine when and where within the hierarchy a violation has occurred and isolate those violations down to the offending mailer within a campaign, attached to a specific list, owned by a specific brand advertiser.